On Thursday, March 15, 2013, theBestArts and Ben Cameron's BROADWAY SESSIONS held a "CMU Showcase Cabaret" featuring performances by alumni and students of Carnegie Mellon University's musical theatre program. 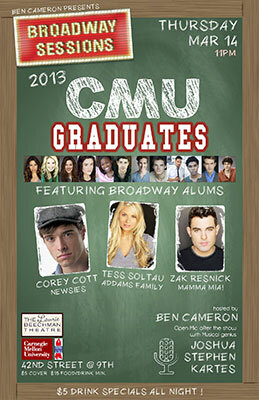 Top alumni and students celebrated and introduced the talents of the CMU musical theatre class of 2013. Special thanks to Ben Cameron and Broadway Sessions for hosting the event, to Trevor McQueen for coordinating senior performances, and to Stephen Joshua Kartes for his expert accompaniment. The cabaret was held at the Laurie Beechman Theatre on Thursday, March 15, 2013, at 407 W. 42nd St., New York, NY. Cover was $5. A portion of the proceeds benefited Broadway Cares/Equity Fights AIDS; they provide support for critical health issues (including HIV/AIDS) to individuals in the entertainment industry and to over 400 community organizations across the country. BC/EFA is a 501 (c)(3) non-profit. If you're on Facebook, please follow us! Videos from the 2013 event will be posted here shortly.